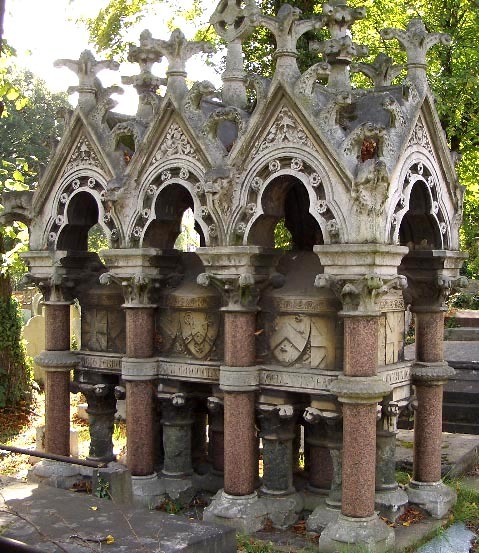 Kensal Green Cemetery describes this funerary monument for Ricketts, a naval commander who had served under Nelson and married an heiress, as "an atrociously rich Gothic shrine'. . . . The raised sarcophagus, decorated with shields, is enclosed by eight red Peterhead granite colonnettes and rests on stubby colonnettes of green Cornish serpentine; the canopy sports cusped arches, gargoyles, crockets and finials galore." Coones, Paul. Kensal Green Cemetery: A Concise Introductory Guide & Select List of Notable Monuments, Together with a Plan. Friends of Kensal Green Cemetery, 1994.